Tor Otto Fredlin. 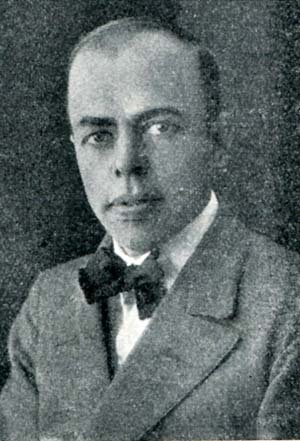 Photo published in Akvariet, 1932. Unknown artist. Public domain. In my mildly energetic aspirations to acquire a full set of the Swedish aquarium magazine Akvariet (1927-1988), I was fortunate to add recently the 1932 volume, which turned out to contain several highlights. This volume, the October issue contains a rare description of a new fish by Wilhelm Schreitmüller, naming it after the Swedish painter Tor Otto Fredlin. It is not cited in the Catalog of Fishes and Google doesn’t know about it yet, so it may be worth commenting on. Tor Otto Fredlin was born in north Sweden, in the town of Härnösand, 16 June 1890. After school he tested different professions and among other things assisted a a taxidermist. His inclination seems to have been toward painted more than real animals, however. He studied painting at Althin’s School of Painting (in Swedish: Althins målarskola) in Stockholm 1910-1912, and his first exhibition was in Härnösand in 1915. He moved to Lund in southern Sweden in 1920, and stayed there for the rest of his life. Fredlin never married, and he made only one trip abroad, to study art in France in 1924. As an artist he mainly painted nature settings with animals in focus, mostly birds, but also colourful landscapes. Most paintings seem to have been aquarels and oil paintings of small size. Fredlin’s colour plate Akvariefiskar I in Wallengren & Hanström, 1939, 1948, Djurens värld, Fiskar. Actually a composite copied from other illustrations not in copyright. His artistic career apparently was not rocketing at any time. His paintings still sell, at modest prices, but let us remember him primarily for painting a grey fish golden, as close to an alchemical GMO one can come. One would expect Fredlin to have painted his golden guppies also in oil, but I am unaware of a colour illustration. Brorsson (1942) reproduces a drawing in monochrome halftone, presumably of a colour painting. It is a typical Fredlin scene, with half the painting empty, and the subject hovering in front of vegetation. Like Fredlin’s fish illustrations in Djurens värld the drawing lacks artistic quality. Many or all of his fish drawings seem to be exact or crude reproductions of photographs. In the colour plate shown here, the Rivulus urophthalmus (yellow top fish) and Hemigrammus ocellifer (group of greys to the left) are exactly as on photographs in Innes (1935, pp. 112, 243), even in number and position, even the background has been copied. Presumably living aquarium fish weren’t within the artistic nearsightedness of the master. A short time ago, Mr Brorsson, Malmö, sent me a fish can with some golden yellow Lebistes reticulatus (Peters), millionfishes or Guppi), along with a message that these were produced in culture from the typical and natural form by a Swedish aquarium friend, Mr T. O. Fredlin, over a period of 8 years, and that the fishes nowadays leave a stable offspring. In shape those animals are typcal Lebistes reticulatus (Peters). The males have a length of 2-2.5 cm., the females 3-3.5 cm., all including caudal fins. On the back, the males are dark yellow, while hindbody and caudal pedcuncle are light yellow, the latter with 2 vermilion round spots, in front of which are placed a dark and a copper red spot. One of the males sent along has a dark, white-margined dot at the base of the caudal fin. The scales on the anterior par tof the back have a faint dark margin. The females are orange yellow on the back and on the entire hindbody with caudal peduncle. The pregnancy spot is pink red. The scales on the anterior part of the back are finely dark margined. The abdomen is yellow white. We thus have to deal with heare typical xanthoristic specimens, whose fins are transparent and seem to be equipped with a yellow cast. Pectoral and pelvic fins’s base is reddish. and many others, which all of them also are only xanthoristic forms of the species in question. In the same manner certain melanotic forms of lizards, e.g., “Lacerta lilfordi maluqueurorum (Mertens)” and several others receive their particular variety names. So – why should one not then be able to give the xanthoristic form of Lebistes reticulatus (Peters) a proper variety name? “Was dem Einen recht ist, ist dem Anderen billig”! Food, care and water temperature is for the new guppy the same as for the original species. A similar text, in German, was published in the Wochenschrift in 1933 (Schreitmüller, 1933). Schreitmüller’s description does not make the name fredlini available for purposes of zoological nomenclature. On the one hand, the International Code of Zoological Nomenclature covers names of domestic animals (e.g., Canis familiaris for dogs), but is also expressly excludes names proposed for varieties after 1960. For names of varieties proposed before 1961, Articles 45.6.1 and 45.6.4 apply, and they exclude names given to what obviously is not a subspecies except if a later citation exists, before 1985, that uses the name for a valid species or subspecies. This may be worth looking into, but for now, fredlini is not going to lengthen our lists of guppy synonyms, as the name was applied explicitly on a colour form. Fredlin’s golden guppy is not the only one, and not the only one named by Schreitmüller. Already in 1934 Schreitmüller reported on specimens of “Goldguppy” sent alive to him and originating from German breeders in Czechoslovakia (Schreitmüller, 1934). He compared them with the Fredlin guppy, noting that the Czechoslovakian guppy lacked spots on the side and fins, and that the Fredlin guppy was more intensely golden yellow. Schreitmüller named the new form Lebistes reticulatus aurata, noting that: “Dieser name soll nur als Unterscheidungsmerkmal dienen.” [This name must only serve as distinguishing character.] One may interpret this as meaning that Lebistes reticulatus aurata was intented as just a category stamp and not as a scientific name. Seven specimens are preserved in the Zoological Museum in Berlin, and were listed as syntypes of of Lebistes reticulatus aurata by Paepke & Seegers (1986), so obviously these authors considered Schreitmüller’s name available, although they identify the specimens as Poecilia reticulata. In a later issue of the Wochenschrift, Franz Melecky, from Kremsier (Kroměříž, in the present Czech Republic), described how he discovered golden guppies in his plant breeding compound, propagated them and started distributing Goldguppy as Lebistes reticulatus aurata from 1925 onward. Interestingly, Melecky uses the name Lebistes reticulatus fredlini at the end of his story, speculating if a cross with the Fredlin guppy could improve on the size of his own Goldguppy, as they didn’t reach the sizes of the original stock. Does this make fredlini available? Or is this the end of the story? Bej. 1932. Känd akvarieentusiast. Akvariet, 6: 39–40. Brorsson, E. 1942. Den stora akvarieboken. Andra, reviderade upplagan. Sundqvist & Emond, Lund, 300 pp. Brorsson, E. 1956. T. O. Fredlin. Akvariet, 30: 47. Innes, W.T. 1935. Exotic aquarium fishes. Innes Publishing Co., Philadelphia, 464 pp. Melecky, F. 1934. Goldguppy (Lebistes reticulatus aurata). Wochenschrift für Aquarien- und Terrarienkunde, 31: 427. Nyman, T. 1944. Fredlin, Tor Otto. P. 592 i Bohman, N. (ed. ), Svenska män och kvinnor 2. Albert Bonniers Förlag, Stockholm. Paepke, H.-J. & L. Seegers 1986 Kritischer Katalog der Typen und Typoide der Fischsammlung des Zoologischen Museums Berlin. Teil 1: Atheriniformes. Mitteilungen aus dem Zoologischen Museum in Berlin, 62: 135–186. Schreitmüller, V. 1932. Lebistes reticulatus (Peters) var. Fredlini (Schreitm.). Akvariet, 6: 118–119. Schreitmüller, W. 1933. Neuimporte und anderes. Hyphessobrycon bifasciatus Ellis, Cichlosoma cutteri Fowl., Colossoma species, Hyphessobrycon species I und II und Lebistes reticulatus (Pet.) var. fredlini (Schreitm.). Wochenschrift für Aquarien- und Terrarienkunde, 30: 145–149. Schreitmuller, W. 1934. Der “Goldguppy” und ein Totalalbino von Xiphophorus hellerii Heckel. Wochenschrift für Aquarien- und Terrarienkunde, 31: 242–243. Wallengren, H. & B. Hanström (eds.). 1939. Djurens värld. En populärvetenskaplig framställning av djurens liv på grundval av Brehm’s Tierleben utarbetad av Ingvald Lieberkind. Fiskar Band II. Svensk uppslagsbok, Malmö, 439 pp. Wallengren, H. & B. Hanström (eds.). 1948. Djurens värld. En populärvetenskaplig framställning av djurens liv på grundval av Brehm’s Tierleben utarbetad av Ingvald Lieberkind. Fiskar Band II. Förlagshuset Norden, Malmö, 439 pp. Posted in Aquarium fish, Art, Fish, zoological nomenclature and tagged Fredlin, Guppy, paintings, variety on 12 November 2012 by Sven Kullander.